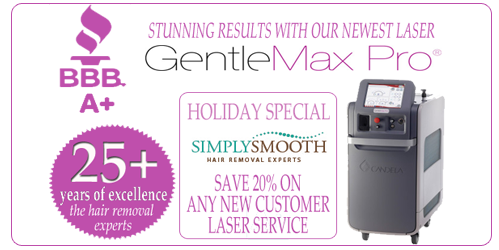 SimplySmooth is the only place in Louisville that can take care of all your hair removal needs, with Laser Hair Removal, Electrolysis and Alexandria Body Sugaring. We all want to feel good about our appearance, but sometimes it’s difficult to be positive when we know there are areas we would like to change if we could. If excess hair is a problem you would like to eliminate, SimplySmooth can help you do just that. These procedures will eliminate your unwanted hair and in the process give you a new self confidence. SimplySmooth can definitely change your life in a positive way! At SimplySmooth, we have a discreet entrance and treatment area providing privacy and confidentially in a comfortable, causal atmosphere. At SimplySmooth you are more then just a patient, we make sure that each client has personalized services and care. You will always know the face behind your service. Laser hair removal is the newest and fastest way to remove unwanted hair permanently and zero percent financing options are available in-house.